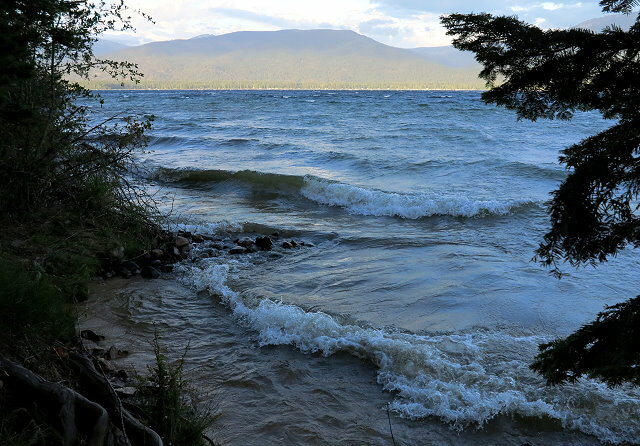 Our trip to Priest Lake in northwest Idaho begins with internet research to find out where the forest service camps are located, followed by a couple of phone calls. 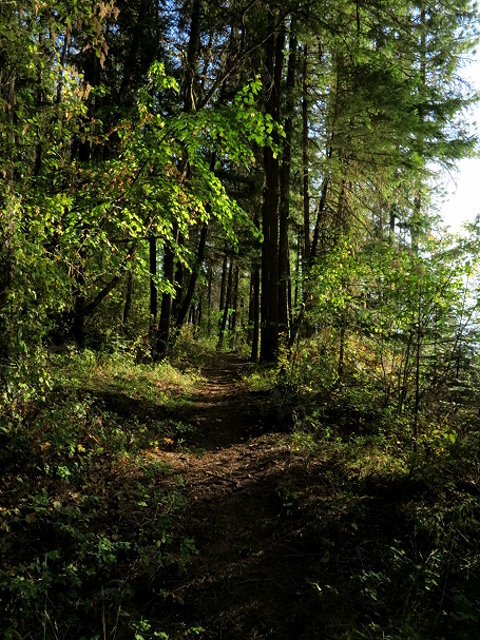 Seems that more and more campgrounds require reservation, which is a drag for those of us who come and go depending on weather, health, and finances. I settle on the campground at Outlet Bay after a call to the camp host: other campgrounds either have no water, are over-crowded, or too far north for us. Wednesday – August 17: Almost everything was packed yesterday, so this morning is just watering the little garden and the houseplants and getting the cold food into a cooler. Even so, we get a later start than hoped for, and almost as soon as we leave Wallace, we run into road construction, which further slows us down. We make brief stops in Coeur d Alene for gas, propane, and a few groceries before we head north to Newport, WA. We encounter road construction much of the way, chatting with a flagger for several minutes at one stop. At Newport, we head east on highway 2 to the small town of Priest River and then north again, on highway 57. Finally we arrive at Outlet Campground, later in the afternoon than we had planned, but luckily several of the first-come sites are still available and we pick the one that suits us best. 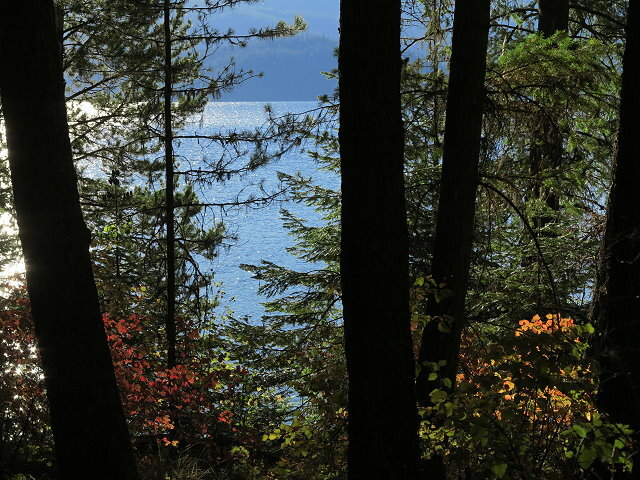 All the sites along the lake are reservation-only, but from our site, we can see little glimmers of the lake through the trees. Our site is roomy, though not as far off the road as I like. 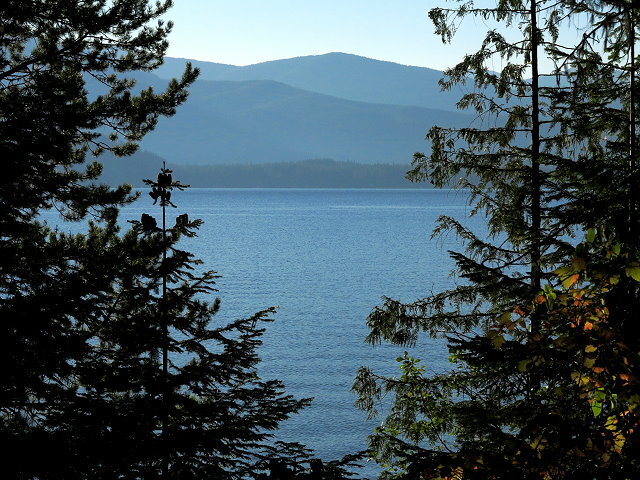 We are surrounded by cedars, Douglas fir, and a variety of shrubs, offering a fair amount of privacy. It takes us awhile to get set up because the parking pad is not level. Once things are in place inside and out, Clifford takes a nap while I walk down to Priest Lake, admiring its clear blue expanse of water. When it cools off, I take the cello out and play for awhile. Figure since I’ve hauled it all the way up here, I’d better make use of it! Once Clifford wakes up, we have nachos for a late dinner. 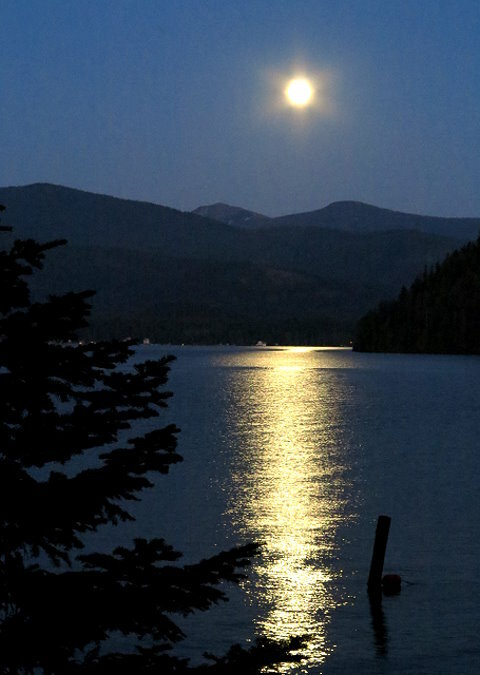 Before heading to bed, we admire the reflection of the rising moon on the lake, happy to be out of town. Thursday August 18: First thing this morning, I go for a walk on the trail along the lake shore that I noticed yesterday. 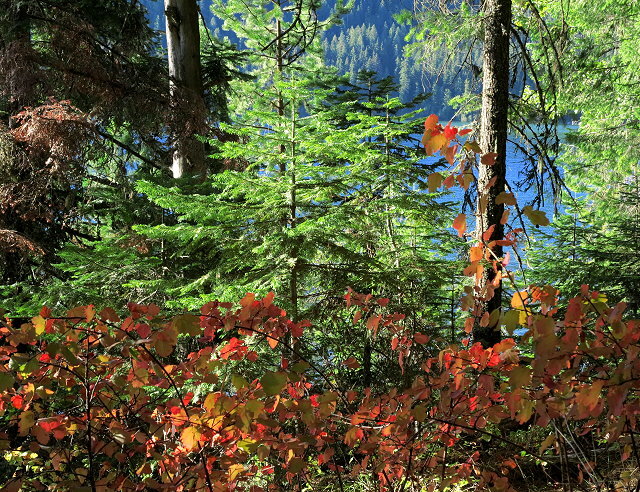 The trail goes right next to the lake-side campsites, but once I am past the campground, the trail is pretty with some autumn colors and views of lake through the trees. Back at camp, I talk to Mel, the 83-year-old camp host making his rounds, then make tea and write in my journal. After breakfast, I take out the cello and serenade the lake and the trees. In the afternoon, I begin reading the manuscript of a book written by very special and interesting friends of ours, Alex & Ardeth Merklinger. I have to read on Clifford’s tablet, which is not the easiest way to read a book, but that is what I have. 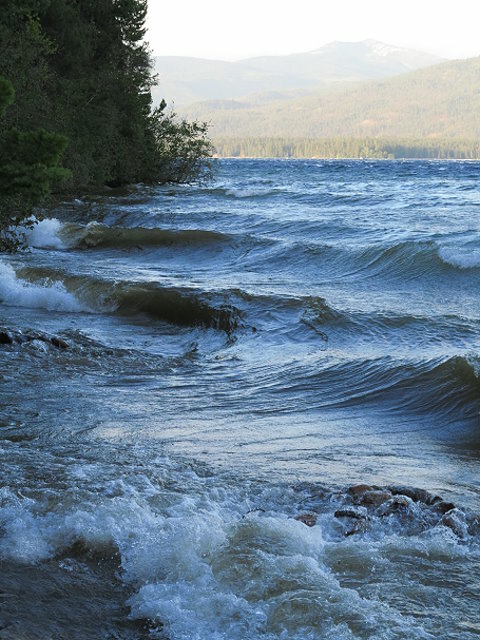 Later on, a strong wind comes up very suddenly and the calm lake is now white-capped with hefty waves rolling into the shore. Quite exciting, really. We have chicken ‘n rice and veges for a tasty dinner. After clean-up, I take a shower before heading to bed, washing off the warmth of the day and the dust of the trail. 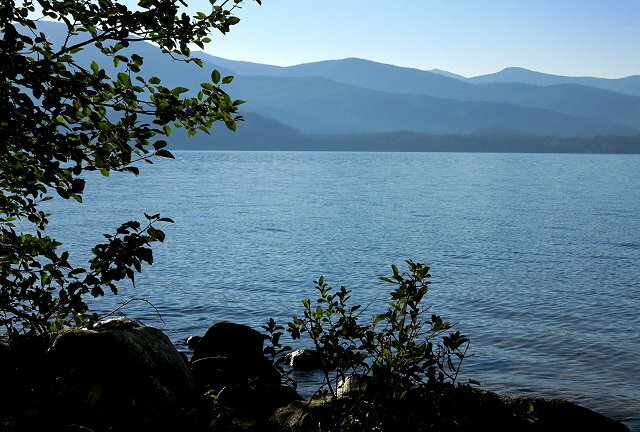 “…I take out the cello and serenade the lake and the trees.” }- Beautiful ! Nice blog post! Sounds like a lovely place. Beautiful pictures too!